Left: photo by Jenn Burt. 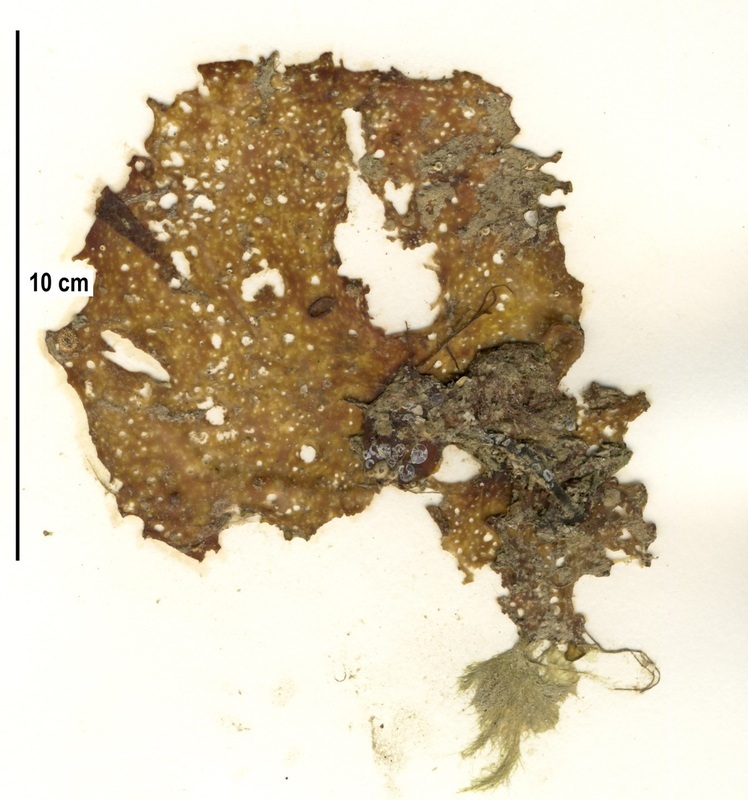 Right: specimen in poor condition from a Calvert Island beach: torn blade, bleached, and covered in epiphytes. Image courtesy of Sandra Lindstrom. Collection number SCL 15386 in the UBC Herbarium Algae Database; search the specimen in the database for more information, or search the species for more occurrences. This perennial red alga has dark red circular blades that somewhat resemble saucers or inside-out umbrellas. These blades reach 30 cm in diameter, are conspicuously veined underneath, and often tear into wedge-shaped sections. A cylindrical branched stipe attaches like a flower stem to the bottom middle of each blade. This species reaches 20 cm tall. This species undergoes stipe elongation: a small nubbin at the centre of the blade grows into a new stipe starting in late spring, from which a new blade develops in winter. This creates a vague cup and saucer-like appearance. The previous year's blade gradually gets worn away, leaving a single blade with a flower- or upside-down umbrella-like structure. This species grows on rock in the lower intertidal and shallow subtidal. It is found in semi-protected to semi-exposed locations from the Aleutian Islands to northern Washington; it is also found on along coastlines in Japan and the Kuril Islands in Russia. 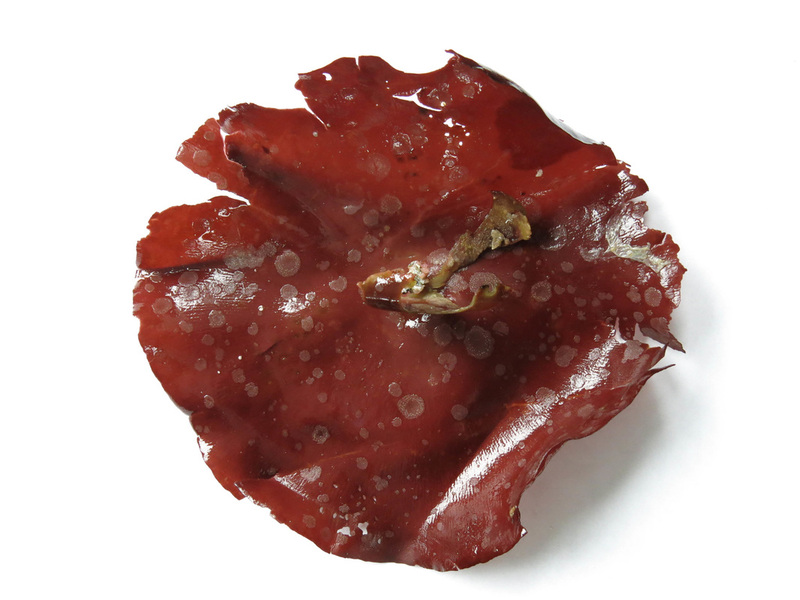 Cup and saucer seaweed (Constantinea simplex) is smaller (to15 cm tall and less than 15 cm diameter), much less lacerated (if at all), and has an unbranched stipe. 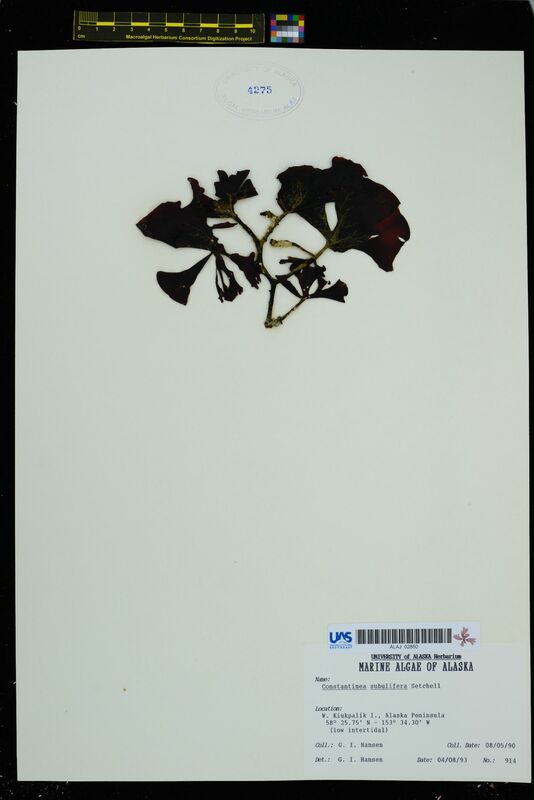 It is found in exposed locations and its range extends further south, to southern California. Northern cup and saucer seaweed (C. rosa-marina) isn't found south of southeastern Alaska; it is also branched, has inconspicious blade veins, and grows to 15 cm tall and 15 cm in diameter. Lindberg, M. and Lindstrom, S. (2010). Constantinea subulifera Cracked Saucer. Seaweeds of Alaska. Accessed 02/04/2015. O'Clair, R. and Lindstrom, S. Constantinea subulifera Setchell. In Klinkenberg, Brian. (Ed.). E-Flora BC: Electronic Atlas of the Plants of British Columbia. Lab for Advanced Spatial Analysis, Department of Geography, University of British Columbia, Vancouver. Accessed 02/04/2015.